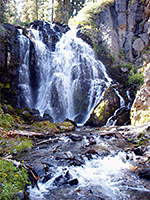 The most popular short hike in Lassen Volcanic National Park is the 1.5 mile route to Kings Creek Falls, where a good sized mountain stream drops 50 feet over a basalt cliff, preceded by a 1,000 foot long whitewater cascade over more of the same dark, volcanic rocks. The waterfall is the prettier of two in the park reached by an easy trail, the other being Mill Creek Falls a few miles west. The Kings Creek path crosses a flower-filled meadow next to the stream though most is through thick pine and fir woods, descending gradually apart from a short steeper section at the cascades, and ending at the brink of the multi-tiered falls, as the waters tumble into a shallow, sheer-walled canyon, fringed with ferns and moss. Kings Creek - cascade and falls (mp4; 1:28 min; 17.4 mb). The Kings Creek trailhead has ample parking, on wide pull-outs at both side of the park road, CA 89 - about half way (16 miles) between the north and south national park entrances. Several longer hikes begin from this location including a 5 mile loop to Bench Lake and the Sifford Lakes but most people are here for the 3 mile round trip to the falls (500 feet elevation change). The well used trail descends a wooded hillside to flat land at the edge of Lower Meadow (a likely place to spot mule deer and other wildlife), soon reaching a junction with the first part of the Bench Lake loop. The main route stays relatively level as it winds through the trees to the top of the cascade, where Kings Creek drops 200 feet over the next quarter of a mile via dozens of small falls and chutes. A very short spur leads to a viewpoint at the edge of a cliff, while two other paths continue to the falls. Left fork (the 'horse trail') makes a longer but more gradual descent, away from the creek, while the other follows right next to the fast-flowing water of the cascades, going down quite steeply over stone steps and boulders, a section that is sandy and rather slippery. 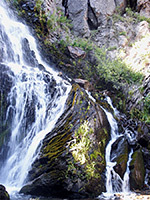 This path rejoins the horse trail below the cascade then arrives at the falls 0.3 miles further, where two routes branch off - one to the south, meeting the Pacific Crest Trail in Warner Valley after 2.5 miles, and the other to the northeast, towards Corral Meadow in the center of the park. The Kings Creek path soon reaches the falls, ending at a railed overlook above the drop, though it is easy enough to scramble down to the base, where the views are better. Downstream, the creek stays fairly enclosed, flowing through a bouldery canyon and still descending steadily.